Sunday was the first day in the better part of a week that the weather was not absolutely miserable so I decided to take a “short walk”. This “short walk” (It was a very beautiful day yesterday after all.) gradually evolved into a trek from Greenpoint to Flushing Avenue. Tired, I decided to take the G train home from Metropolitan. 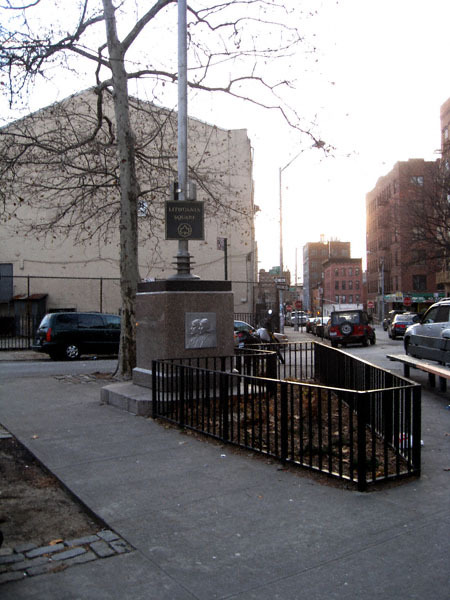 The intersection of South 2nd, Hewes Street and Union Avenue is where I found “Lithuanian Square”. Perhaps “found” isn’t the right word. “Rediscovered” might be more appropriate. I have walked by this park on a number of occasions. This time, however, I had the time and inclination to see what this monument is about. “Lithuanian Square” as it is called (and for the record it is shaped more like a triangle but I’m not going to argue semantics) was created in 1935 (the monument came later in 1957) to commemorate the 1933 trans-Atlantic flight of Stephen Darius and Stanley Girenas —Lithuanian immigrants both— from Floyd Bennett Field in New York City to Kaunas, Lithuania. This in and of itself seemed interesting enough (especially to yours truly who is part Lithuanian*) until I got home and did a little research. 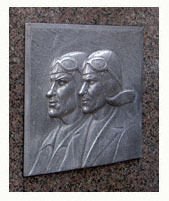 That’s when I learned this monument is in fact only half correct: Mr. Darius and Mr. Girenas did make it across the Atlantic Ocean in an aircraft they christened (patriotically, if not very imaginatively) the “Lituanica“. They did not, however, make it to Kaunas. Their airplane crashed 400 miles short of its destination in what is now Pszczelnik, Poland. They died instantly. Despite the grim outcome of the Lituanica’s quest, the story behind it is a fascinating and uplifting (no pun intended) tale. Unlike Richard Branson, Darius’s and Girenas’s intercontinental jaunt was very much a grassroots effort. As you will learn from this article in the July 18, 1933 edition of the New York Times. LinksminkitÄ—s! For those of you who are wondering, two years later another Lithuanian made a jaunt across the Atlantic Ocean. 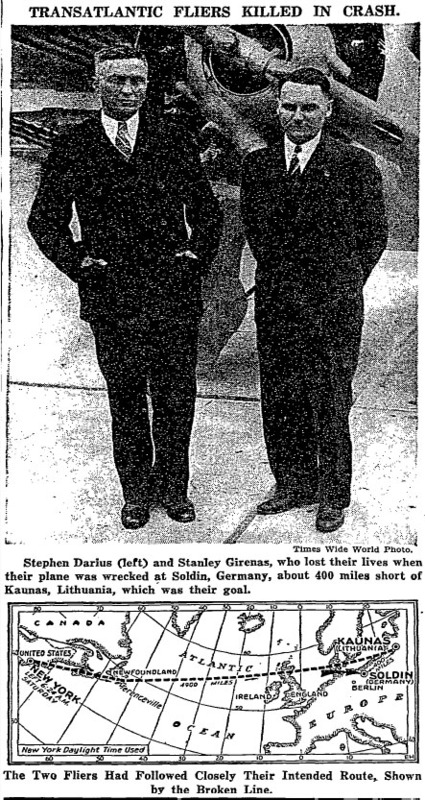 His name was Feliksas Vaitkus, the year of his flight was 1935 and he too did not complete his itinerary as planned: instead of making it to Kaunas, his craft crashed in Ireland. Mr. Vaitkus, however, was lucky enough to walk away. He was the sixth person to cross the Atlantic Ocean in an aircraft. *As my Polish friends here (upon seeing my surname) in Greenpoint like to remind me. No worries, they’re very nice about it. They reserve their rancor for Russians and Ukrainians. I love these historical G-point posts! To be fair, lsmith: They did make a trans-Atlantic flight. From Brooklyn to Germany. Darius and Girenas crashed in what was then Germany and were given a funeral there replete with Nazi flags on their caskets. In the clarity that is 20/20 hindsight this is an abomination. 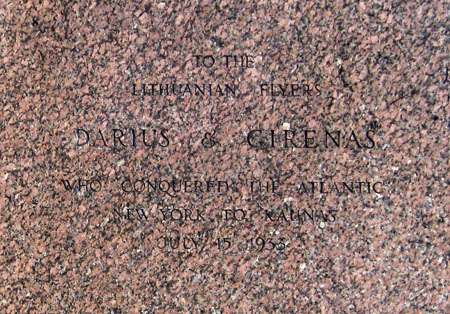 Darius and Girenas were not failures. They were brave, hardly pathetic. They deserve recognition.